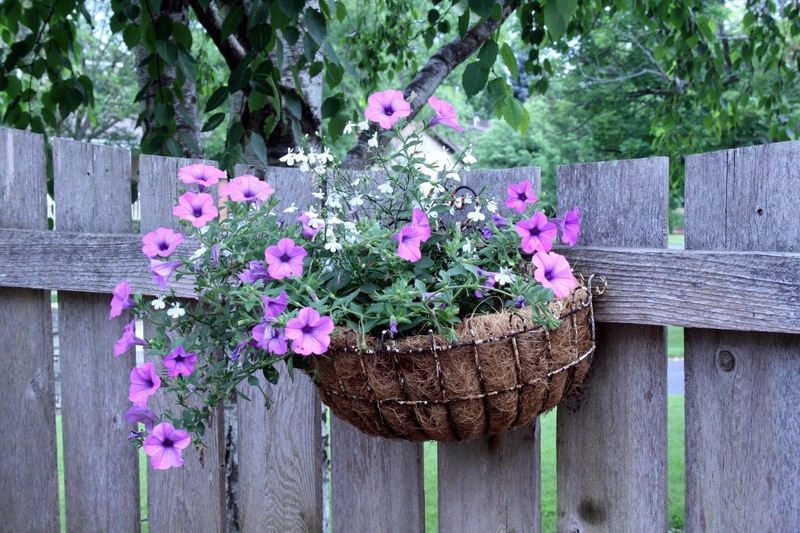 I have a couple baskets like this hanging off the fence on the back patio. I bought the $6.99 little pots at Home Depot to fill them and they are growing great ! 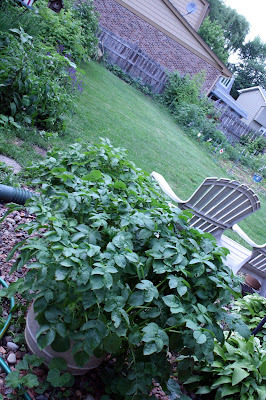 These are my potted potatoes >> Growing so tall . Yesterday we looked between the plants into the pots and there were potatoes showing . I added some more potting soil to the top , so hopefully the potatoes will keep growing. The berries are growing and hopefully in a week or two they will be ready. 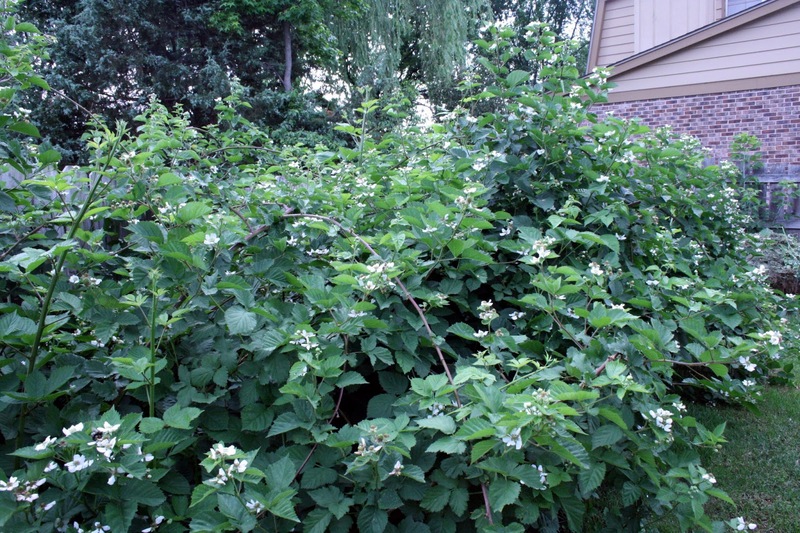 These are the blackberry plants. HUGE , is all I can say .. It started with 3 little tiny plants .. Last year our crop got ruined with the horrible heat , so hopefully this year we won't have that problem again. This is my little strawberry patch in the back of the garden .. so far over 10 pounds picked. There are a lot to pick now but we are having thunder, lightning and RAIN..and more RAIN.. 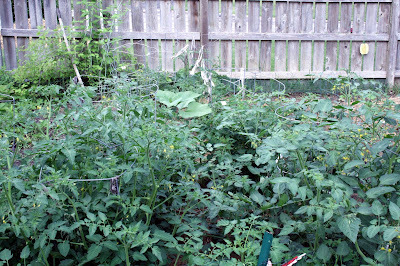 The tomatoes seem to be doing great , there's a lot of little green tomatoes and blossoms . I have 13 plants and a bunch of volunteers that came up by themselves from last year . 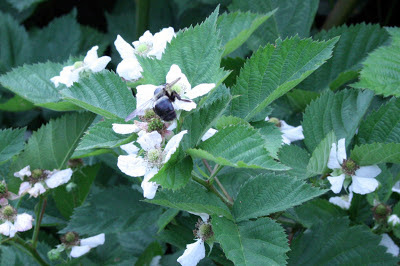 More of the blackberry patch . I think its about 20 feet long . Two weeks ago we had a tree on the edge of our property taken down.. It was amazing to see the guy up there taking it down piece by piece. Our neighbor , ( the house in the photo) told us the tree roots were messing with her sewer lines ..so we split the cost of taking it down. 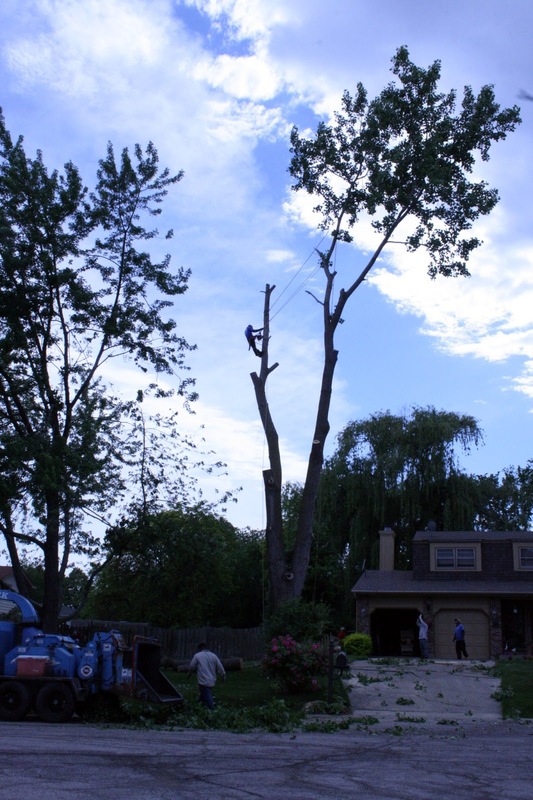 It was a huge tree, they said way over 100 years old. It was sad to see it go. Our home is on the corner of a cul de sac, so we don't have a very big back yard. 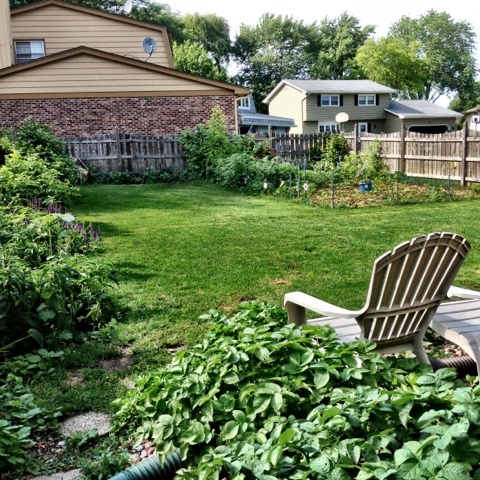 This is basically our back yard and side yard where our vegetable garden is . 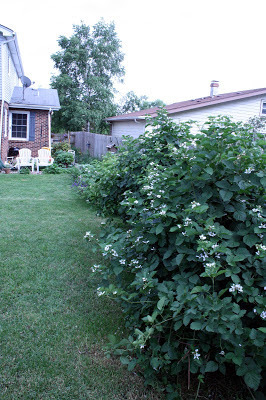 The big plants in the back of the garden are black raspberries . this is their second year, last year there were a few small berries , I think from the heat , but this year they are loaded with berries. Hopefully they keep getting bigger. I did a little patriotic stitching. Its a Little house Needleworks design. Yesterday we went to the Goodwill and I found 2 small square frames that I came home and painted off white. I am going to use one of them to finish this off. Thanks as always for visiting and your nice comments ! 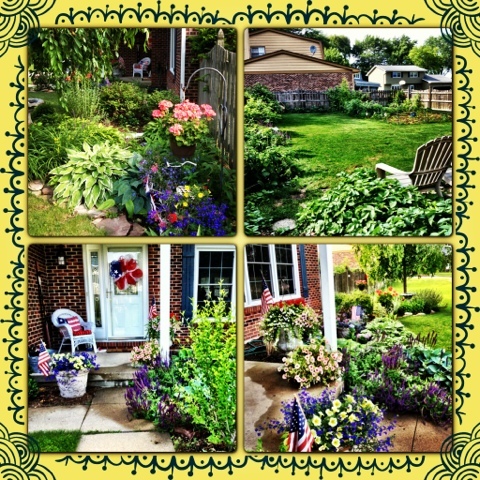 Your yard and gardens look great, Priscilla. 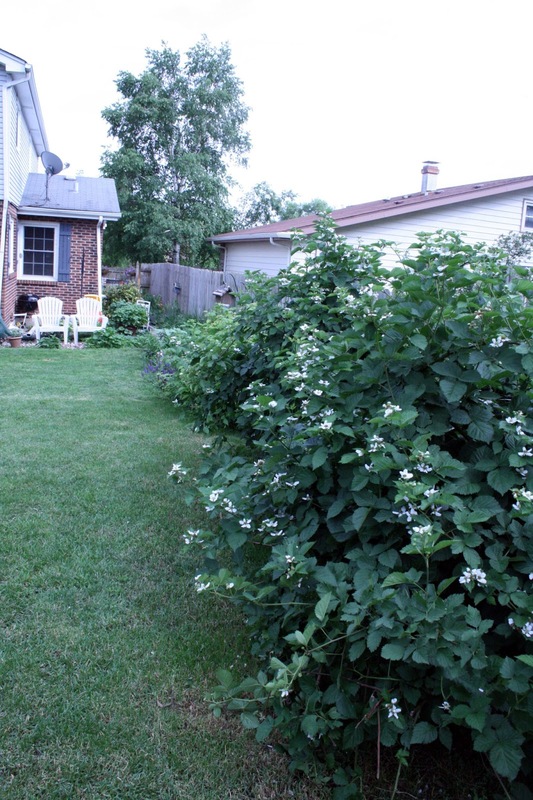 For a smaller yard, you sure do pack in a lot of great fruits and vegetables. 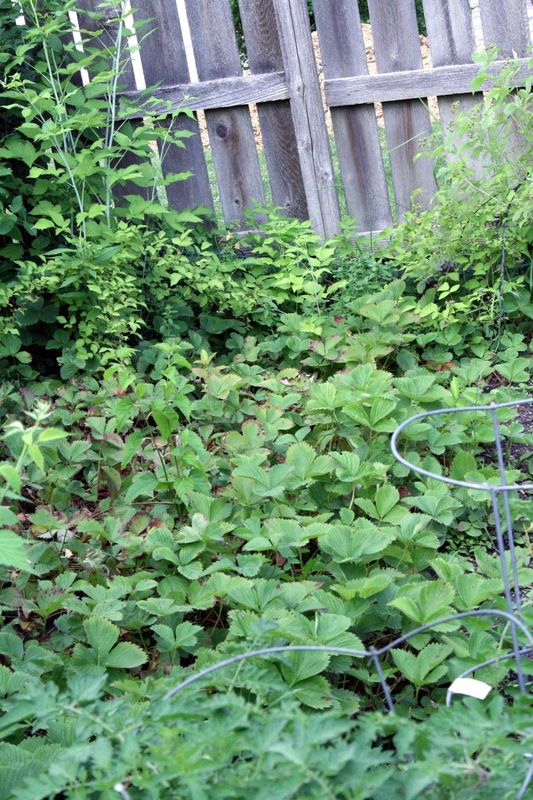 I'm so glad your strawberry bushes are producing so well. I really want to try growing some myself next year. We have such problems with deer and birds though, I'm not sure we would be very successful. 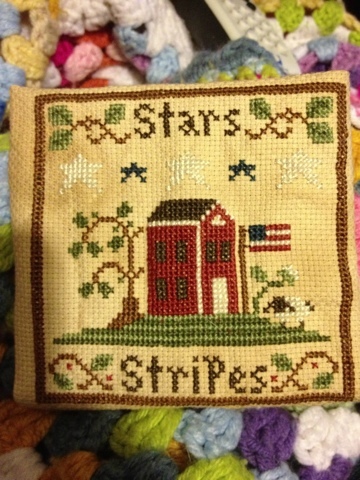 Cute little stitching--I love patriotic pieces! Your yard and porch look just wonderful. I am so impressed with all the wonderful fruits/berries that you grow. 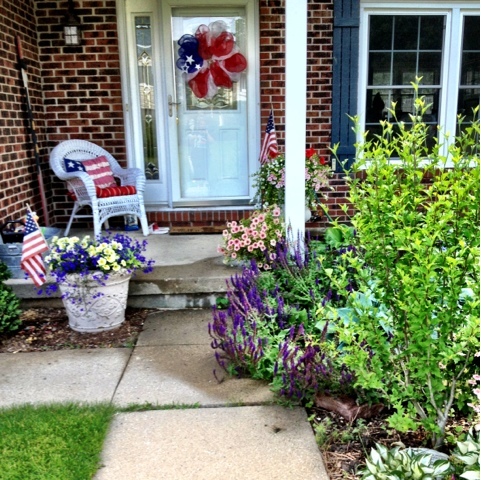 Plus your patriotic porch is a delight!! What a great yard! And love the patriotic décor! I would love to have the garden space you have for growing veggies/fruits. My neighbor has a green house and everything is growing great, but our soil is sandy so I am not sure I would have success. Your front porch looks great. Loved the tour Priscilla! Your garden is so lovely. 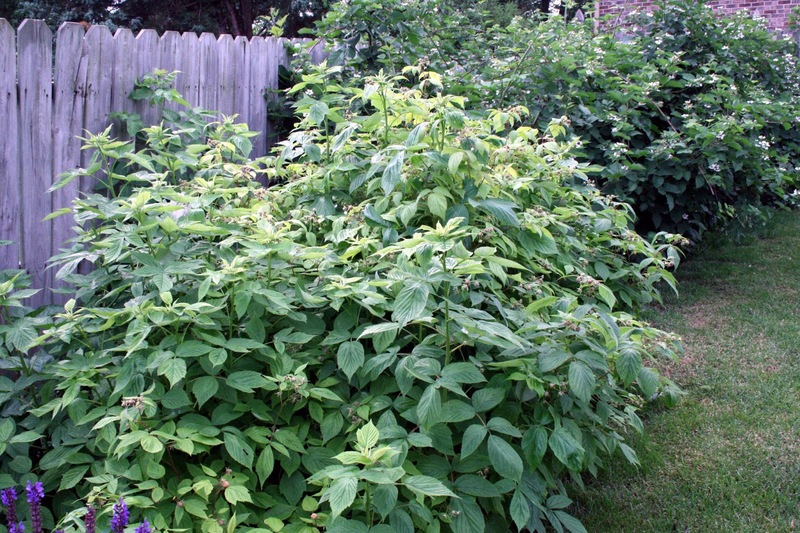 I wish I had room for berries. 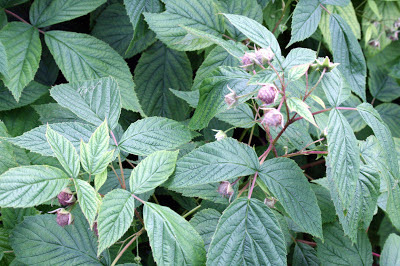 I love all berries and raspberries are my fav. Just made rasp, freezer jam last week. Our yard is lined with a rock wall so it makes it smaller. Really no where for them. Thanks for sharing with SYC. 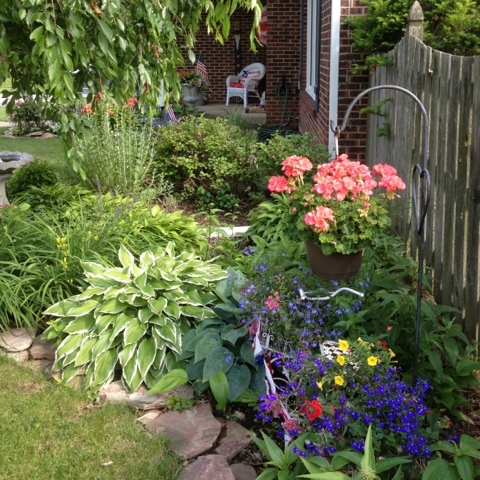 I love a beautiful garden tour and yours sure did qualify!! Thanks for sharing! Your garden is growing very nicely! I am trying a small scale garden this year for the first time and yours is an inspiration to see. Love the hanging baskets idea also! Your gardens are just gorgeous! 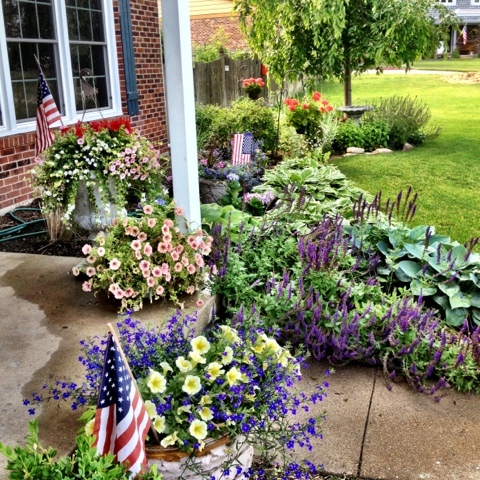 What a wonderful variety of flowering plants! And fruits and veggies too! Don't you love picking from your own garden! Redoing the Red White and Blue..